Many times crucial details are hidden in video due to poor lighting or improperly adjusted and maintained cameras and video equipment. When dealing with color video, details are often more prevalent in one color than another. With dVeloper, it's easy to isolate the video color space that holds the most valuable information. With the click of the mouse, dVeloper compensates for the poorly exposed video. By analyzing the entire video, or just a region of interest, dVeloper automatically adjusts brightness, contrast and gamma to bring out more detail. 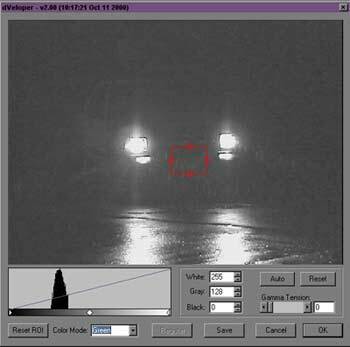 dVeloper removes noise and video graininess through a time-lapse processing technique called frame averaging. When the target remains still for even a moment, video noise and other transient items like rain and snow are removed, revealing the details hidden beneath. The dVeloper interface (prior to processing the image).